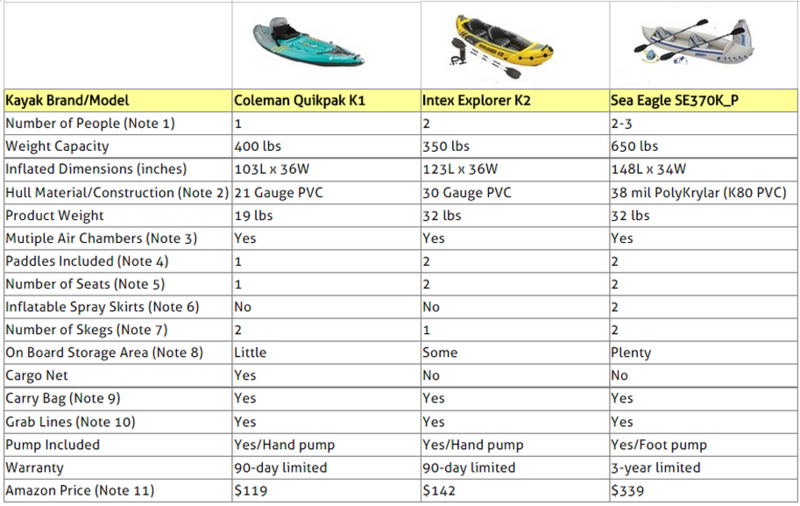 Compare Inflatable Kayaks: Coleman Quikpak K1, Intex Explorer K2 or Sea Eagle SE370K_P? Gone are the days when to enjoy kayaking you had to strap your kayak on the roof of your car when heading to your favorite lake or beach. Nowadays, you can use inflatable kayaks that were designed to transform your outing on the water into an easy, safe and fun filled activity. Inflatable kayaks are not fragile plastic beach toys like some might think. On the contrary, quality inflatable kayaks are solidly built crafts that can handle rough waters and craggy coasts and will provide you with many happy experiences, be it a fishing trip, camping adventure or down the river discovery voyage! They are very easy to transport anywhere, as once deflated, they can simply be carried in a bag or backpack and stored anywhere. They usually have multiple air chambers, so in the unlikely event one chamber starting losing air, you can still paddle to shore. They are very fast and easy to set up as all you need to do is pump air into the air chambers which usually takes no more than 5 to 12 minutes. This article will compare Intex Explorer K2, Sea Eagle SE370K_P and Coleman Quikpak K1 inflatable kayaks. These were not just very popular among Amazon customers at the time this article was written, but they had also received excellent reviews from most Amazon buyers (an average of at least 4 stars each, out of 5 stars!). Note that the Coleman kayak is also known as the Coleman Sevylor (Coleman bought in 2004 the French company Sevylor that makes inflatable boats). Though the Sea Eagle comes with only two seats, there is enough space for a third person or child. Note that this kayak can support up to 650 lbs. An additional chair can be purchased if desired (see below Amazon section). Coleman Quikpak K1: The 21-gauge PVC construction of the hull and the rugged tarpaulin bottom provides durable protection from punctures. The thick PVC and reinforced bottom are part of the Coleman proprietary Airtight system which guarantees no leaks, and in the unlikely case of a puncture, the multiple air chambers (3) will help you paddle back to shore. Intex Explorer K2: The 30-gauge PVC hull is extremely resistant to punctures and incredibly durable. It has I-beam construction floor and seats that are inflatable and like the Coleman it has 3 air chambers, so if one chamber starts losing air, you can still paddle to shore. The construction presents a curved front and a curved end, good for kayaking on rougher water. The taller profile on the sides allows to stay higher out of the water. Sea Eagle SE370K_P: The rugged and spacious K-80 PolyKrylar hull is tough enough to withstand dog paws! K-80 Polykrylar is used to achieve high frequency welded seams and provides the hull extraordinary tear resistance in every direction. It is formulated with special additives to guarantee long term resistance to ultraviolet (UV) rays, gasoline, oil, and other chemicals. In addition, the Sea Eagle also has an I-beam construction floor, three air chambers, inflatable seats and lashed down inflatable spray skirts. Though all three kayaks considered here are made of very resistant material to tear and puncture, clearly, 30-gauge PVC is more resistant than 21-gauge PVC and K-80 PolyKrylar is the most resistant of the three. Multiple air chambers are needed so that in the unlikely event one chamber starting losing air, you can still paddle to shore. The paddles that come with these three kayaks can be broken into sections so that they can be easily carried within the carry bags. The Coleman seat has an ingenuous design that converts it into a padded backpack complete with shoulder straps that is used to carry the deflated kayak. The Intex and Sea Eagle seats are both inflated. The Sea Eagle seats are also covered with canvas and are very comfortable. Spray skirts keep out rain and the occasional above-average wave. A skeg looks like a fin that is underneath the hull and that provides directional control and allows you to move in a straight line as you paddle. The Coleman kayak skegs are fixed while the Intex and Sea Eagle skegs are removable. Coleman has some storage space behind the seat, but you would need to use bungee cords or a tether to hold the stuff. Note that Coleman also has a cargo net. Intex kayak has some space at both ends of the hull. Sea Eagle being the largest of three has the most storage space, specially if only 2 people are on board. All three kayaks come with a carry bag. Note that the carry bag that comes with the Coleman is the kayak seat that converts into a backpack! All three kayaks have two grab lines, one at each end of the hull. They are used to manually carry or pull the kayak. So which of these three kayaks is best for you? Being lightweight, the Coleman Quikpak K1 kayak is not designed to be constantly bashed against riverbed rocks in rough water conditions, and it might be somewhat unstable where there are heavy waves and strong winds. But it will definitely put up to a reasonable amount of rough conditions and it is definitely suitable to be taken out on the lake where water is calmer than on a sea beach, and most Amazon customers who have used it have confirmed that it is indeed very stable in reasonably calm waters. For beginners, there is no doubt that this is a great kayak that comes at a very reasonable price. It’s well constructed with multiple air chambers, lightweight, rapidly inflatable, and easily portable in its own backpack. The back rest and ample leg room allows comfortable paddling when in the water. It even has some storage space, a cup holder and a cargo net so you can bring along some food and gear when needed. Everything considered, for those looking for a single person kayak, this is our top recommendation. Some Amazon customers have claimed that the Intex Explorer K2 is the kayak version of the Cadillac brand! Looking very sharp with its bright yellow color and bold black markings, it provides a smooth and roomy ride with great tracking and easy maneuverability. The only thing that is unlike a Cadillac is the price which is quite reasonable for a feature rich 2-person kayak with such ease of use and such outstanding control. You will find this craft surprisingly stable, rarely feeling any danger of tipping even in agitated waters. It's made of high quality material which does not look like it can rupture easily over a rock or two, and it has sufficient storage for extra gear. This kayak is easy, comfortable, powerful, attractive, and affordable. It's certainly a high quality craft that will provide you with many happy experiences on the water. Everything considered, for those looking for a 2-person kayak, this is our top recommendation. Now, if you have a small family you want to take along for a fun kayak ride on your favorite lake or river, don't look any further than the Sea Eagle SE370K_P. With its 650 lbs load capacity, it can accommodate a small family of two adults with one or two young kids, or even three adults. The kayak comes with two seats, but there is room for an additional seat that can be obtained separately (see Amazon products below). When the kayak is used by just two people, there is ample room to bring along all the extra gear you need for that long weekend fishing trip or camping adventure. This affordable kayak is as lightweight and portable as it gets for its larger size. One can only be impressed by the quality, craftsmanship and durability of this kayak. The 38ml K80 PVC used as the hull construction material is much thicker and more durable than expected and feels like you would really have to try hard to puncture it. While on the water, Amazon customers have reported that they were surprised by just how stable this kayak is and how well it tracks even in windy conditions and agitated waters. It's even equipped with lashed down spray skirts to keep the craft dry and protected from splashes and waves. Finally, like the other two kayaks described above, the setup and take down procedures are very easy and quick, and it all fits easily in its carry bag. For those wishing to take along their family on their kayak adventures and those that are looking for the ultimate kayaking comfort, the Sea Eagle SE370K_P is our first recommendation. Please click the kayak of your choice below for price information or to purchase.